1.) Why hiring a wedding planner? Weddings seem to be the most wonderful celebrations in the world – 2 persons declaring their deep feelings for each other! But planning a wedding also requires a lot of organization and preparation to make it a special day. A wedding planner will do all the hard, time consuming work for you, making sure, that you have time enough to enjoy your engagement. Organizing your wedding abroad on your own also requires deep information about the country and language. If you decide to have it organized by My perfect wedding, you can be sure to have a profound partner supporting you at all times from the first step till the ceremony. 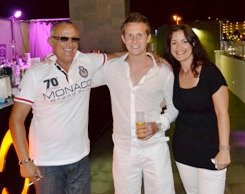 You´ll feel like a guest at your own party, as all the coordination is handled by a professional. Weddings are our passion, so we ensure that your event will become outstanding and the ceremony runs smoothly. Hiring My perfect wedding gives you the opportunity to lean back, viewing photographs and choosing from a wide range of selected venues and suppliers and profit from our insiders´ tips. Leave contracting venues, photographers, flowers and other providers to us and have only one person in charge instead of plenty, who knows which suppliers are the most reliable and quality-concious. We take care of your event, make sure that your wishes will come true and you just get involved in every step of the planning as much or as little as you want to. Please be assured, that having Nadine García Breuer as your wedding planner abroad will not affect your budget, because of our agency rates we get discounts from suppliers which will be forwarded directly to you! 2.) What´s the difference between My perfect wedding and a travel agency or in-house organizers? 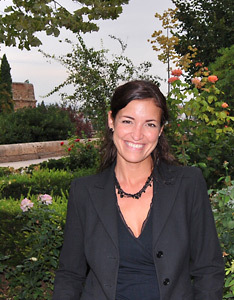 Nadine García Breuer and the team of My perfect wedding are experts in wedding and event organization and also we are an agency that can even arrange accommodations of any category and style, transfers, excursions and much more for our bridal couples and their guests for the whole period of their stay. We are based directly in Tenerife therefore we have a very profound knowledge, will personally take care of any arrangement for your event and will communicate directly with you. We stand out from travel agencies and in-house organizers, who have their fixed partners and suppliers, because we can choose from all the vendors on the island and select with you the ones suiting your expectations. Unlike “in house organizers”, that are fixed employees of a venue and work with their products only, we will negotiate fully on your behalf. As we want your day to be the most special in your lives, we are very anxious to fulfill all your desires here in Tenerife and create space for all your ideas. We believe that personal guidance is irreplaceable to organize a tailor-made event: My perfect wedding is your contact person in Tenerife. 3.) What to consider before starting with the planning? Before you start planning, you should have a rough idea about your budget, number of guests and -approximately- when you want to get married. If you already have a certain wedding style, a theme or any other wish on your mind, feel free to let us know. As we work with a wide range of providers, we would like to point out, that a fairly clear idea of your budget is very important for the planning of your wedding in order to offer you the best tailor-made solutions and ideas. As it is very important that we have the knowledge to organize the most romantic wedding for you, within your budget and possibilities. 4.) What does My perfect wedding organize? 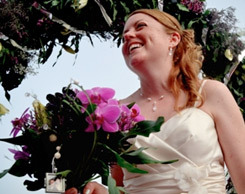 We will take care of any arrangement in Tenerife for you and your guests: From wedding venues, accommodation of different categories and styles, transfers, restaurants, flowers, decoration, photographer, wedding celebrant, excursions and activities until –of course and including- the wedding day itself! Because of our aim to offer you the best rate, at all times, we do not offer flights as we would not be able to guarantee the best rate for you in this specific area. Therefore we suggest, you book your flight either online or directly with you preferred airline as we find it the cheapest and most convenient way for our couples and their guests. Anything you need on the Island itself can be organized by us. 5.) Are there any extra costs when I hire a wedding planner? 6.) When do I settle the payment? Often we are asked when is the payment needed to be made. As suppliers normally ask for payment in advance, the bills have to be settled before the wedding day. Usually we will ask you for 25% of the budget as a deposit, in order to book the venue, suppliers and confirm the date, 50% of the budget a few months in advance and finally the balance (another 25%) 20 days before the event takes place. Once we receive your payment, you will immediately get a receipt by mail, confirming all the services you have booked. 7.) Will the wedding/celebration still have my personal stamp on it when organized by My perfect wedding? Yes, it will – if not even more-so! Couples seeking assistance with their planning will always remain the decision makers. You will be involved in all steps of the planning as much or as little as you want to and any arrangement will be adjusted to your personal wishes! The big difference with travel agencies/booking agencies is, that we get to know our couples and celebrants very well during the planning period. We always keep a lot of contact with them (e-mail, telephone, skype, facebook), so we know which venue and suppliers will suit their expectations and budget. If you choose My perfect wedding, we have a lot of pictures and descriptions to send to you and of course a lot of ideas how to reflect your personality into your event. 8.) Can we make special food requests? “The way to a man’s heart is through his stomach.” Therefore your wedding meal will be decided together with you considering your tastes and budget. All our caterers have a wide range of different menu suggestions which you can choose from. They use only the best ingredients or if necessary, some food items can be replaced by different ones from the same price category. Our caterers are also open for special food requests of any kind, still we want to remind you to consider your budget as an important factor when asking for menus apart from the suggested ones. We are also aware of possible food allergies of you and your guests and vegetarian options or kids menus can be arranged as well. 9.) Can we have an open bar after the meal? Having an open bar means, that a blanket amount for alcoholic and non-alcoholic drinks will be charged per person per hour and is a very common way to conclude the event. That allows the couple to calculate their budget more precisely, because the drinks won´t be paid à la carte. 10.) Can we bring guests? Yes, of course! We can arrange celebrations, no matter how small or big your party might be: We know the best venues for just any number of guests! And if you feel like including all your family and friends, keep in mind, that we offer great rates for accommodation also for the smallest to the largest group. 11.) Can we get married just the two of us? More and more couples wish to celebrate their wedding day abroad all by themselves. To reduce the costs on the one hand and also to celebrate the day in a much more intimate and undisturbed manner. My perfect wedding respectfully stays in the background, on this day. It’s all about the two of you. 12.) What’s the best time of the year for getting married in Tenerife? Probably the best thing about Tenerife is the climate. There are palm trees, sun and enjoyable temperatures all year long and the average temperature is 23 ºC! The island also profits from a great diversity, it offers something for everyone: From its prehistoric forests and Mount Teide – a dormant volcano and the highest mountain in Spain, to gorgeous beaches and great shopping areas. The different needs of celebrants and guests of all age groups and religious or secular denominations can be covered in just one place. 13.) Can we bring our own providers? My perfect wedding understands that some couples want to bring their own provider, but please note, that in this case we will not take responsibility for the planning or coordination during the event and also we can´t guarantee the quality of the provider. If for example your friend is a photographer, we will not be responsible in the case of technical or other difficulties and you should remember that the photographer is also a party guest which wants to eat and celebrate with you. 14.) 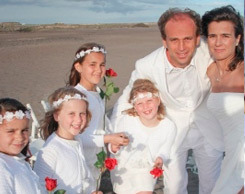 Is a civil wedding possible for foreigners in Tenerife? Yes, it is! We have organized civil weddings before in Tenerife for couples from all over Europe and of course your marriage can also be recognized in your own country. But if you wish to contract your civil marriage in Spain, some paper work has to be done in the planning period. Please be assured, that if you decide to have your civil marriage in Tenerife, My perfect wedding will be at your side when signing any kind of paper and clarifying any upcoming questions. Please click here for more information. 15.) Can I get married spontaneously in Tenerife? 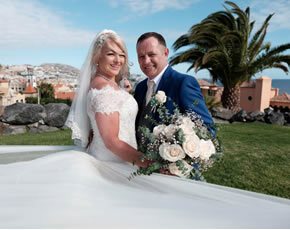 My perfect wedding offers something for everyone, so we are also there for our spontaneous couples who don’t want to wait any longer and get married in Tenerife as soon as possible. Due to our great connections with many different suppliers and our know-how, we can fulfill your wedding-desires within short notice. Are you on vacation on the island and want to return as husband and wife? Just call us! 16.) I have decided to have a beach wedding. What now? 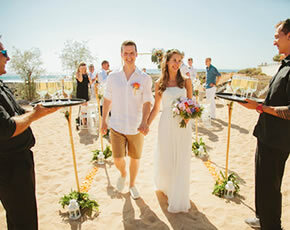 What a great decision to get married on one of Tenerife´s beautiful beaches! Just call or E-mail us for date and time availability. The best time to get married in Tenerife is all year round, but please keep in mind, that the weekends are always the first ones to be booked. 17.) Where are you located? 18.) What are your office hours? We are available for you during our office hours: Monday to Friday from 9.00 am until 5.00 pm. For our confirmed bridal couples, we extend our office hours during the week Monday to Friday up to 6.00pm and Saturday morning from 10.00 am to 1.00pm. Please feel free to choose your wedding date according to your desires apart from our office hours. 19.) Will My perfect wedding coordinate all my payments for all suppliers? Yes, of course! As it is our aim to keep everything as easy for you as possible, you don´t have to pay for every suppliers separately, receiving many different bills, which means that you would have to deal with various terms, conditions and cancellation rules. My perfect wedding will take care of all that for you and will definitely handle all your money transfers with the highest discretion and liability. 20.) Why should we choose your company? 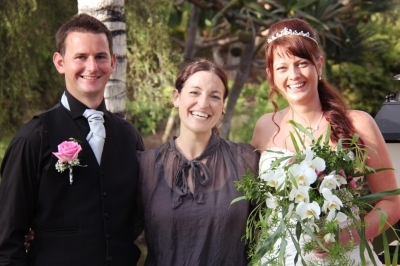 My perfect wedding is the only company in Tenerife, handling weddings as a regular operation. Unlike other companies, doing weddings as a side-business or part-time occupancy, our focus lies 100% on fulfilling couple´s wedding dreams and desires. Established in Tenerife, we are a well-known company on Canary Islands and even across the borders. We are here for you from the first phone call or e-mail. It is our aim to ensure, that your wedding will be outstanding and we will invest a lot of time and efforts to make sure, that you get exactly what you always dreamed of. We enjoy what we do and are extremely humbled by the success. 21.) Do you have references from former couples? Any wedding company should be more than understanding when asked this question and provide you with sufficient information about their former weddings. We give you an idea about the many possibilities we have to make your wedding abroad unique and outstanding by showing you a lot of pictures of weddings organized by My perfect wedding. No comment or reference could ever replace the feeling we get seeing the happy faces of our previous couples and their guests – they speak for themselves! 22.) Will we be able to meet the officiate/marriage celebrant before the wedding day? We ask all our couples to meet us in person before the day of their wedding as well as the officiate or marriage celebrant, review the ceremony, vows, music, venue and so on FREE OF CHARGE! Some other companies just “show up” 30 minutes before the wedding or will charge an additional fee to meet you in person prior to the wedding. 23.) How soon should we reserve our date and time? If you choose a date, we suggest putting a deposit down as soon as you have decided to hold the date. We do not take bookings any further than 2 years in advance. 24.) How do we book our wedding? We are glad to hear, that you want to assign us with the planning of your wedding. Once you have chosen a date and the availability is confirmed through My perfect wedding, we require the appropriate deposit to confirm your booking so we can start contracting the venue and other suppliers. You will also receive a contract from us, allowing us to hire the venue and other suppliers for your event. Planning your wedding with us, you may call or e-mail as much as you´d like and ask as many questions as you want to and we will definitely go the extra mile for you. No, rehearsals are not included. You can be sure, that through our deep knowledge and experience, we are able to plan very well ahead and will inform you about just any important detail in advance. In addition we will give you a time table summarizing all details of your wedding day to ensure you, that we did not forget any of your desires. 26.) What happens if it rains? Although Tenerife offers an average of over 330 days of pure sunshine and we have been extremely lucky not ever having any rain during our weddings on the island so far, we recommend positive thinking with a back-up plan. We will also take care of a second option, a Plan B if you want to, in case of unstable weather. In case of bad forecasts, the wedding could also be postponed to the another day, depending on availability. Still, you might want to consider a wedding insurance. 27.) Will there be any other people on the beach? As all beaches in Tenerife are public beaches, it is pretty sure, that there will be other people on the beach. From experience, families are usually beginning to pack up around 4 pm then there are usually couples enjoying the evening sun, many of them watch from a distance. Normally the wideness of the beach allows the couple and their guests to get enough privacy and in all our weddings so far, we have not had a single interference with beach goers. We do know the most “secret” beautiful natural beaches in Tenerife in order to create the most wonderful atmosphere and intimacy. 28.) Who performs the ceremony? We will provide you with an officiate suiting your expectations and contract marriage celebrants who are able to perform in different languages, rounding off the ceremony with their precisely chosen words. All the speeches are personalized and you can meet the celebrant in advance if you wish. 29.) Can we write our own vows? Yes, of course. We always encourage our bridal couples to be creative, because nobody else can express what they feel for each other better than themselves. 30.) Can we have a friend read a poem? Also friends are more than welcome to add an even more personal touch to the wedding and be part of the ceremony, reading poems, singing or leading a prayer. 31.) How do we receive the pictures? All of our quotations normally include photos by one of our staff photographers. All of the photos on the site have been taken by our photographers. Our couples always receive a memory stick with all their wedding pictures in high resolution and able to be printed out without watermark. We will send you as well a small online gallery, so you can share your pictures easily with your loved ones. We strive to provide our couples with quality photos however weather conditions have to be considered important for the outcome. 32.) Can I combine my honeymoon with my wedding abroad? 33.) Will there be a background music during the ceremony? It is up to you, if you prefer to have music during your ceremony or not. You could listen to your favorite songs through a sound system or we could arrange some live musician for you. Among all the options we highly recommend live guitar music for the background of your wedding ceremony because the gentle sound creates a very nice atmosphere and adds a special touch to just any venue. 34.) Do you provide chairs also at beach weddings? 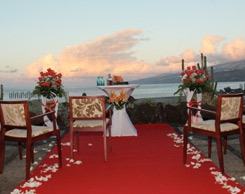 Yes, we can provide chairs for you also at a beach wedding. However we do not recommend having a chair for each guest at the beach, only for close family, elderly guests or those with health problems, as normally guests stand up when recording or taking pictures of the ceremony and for the best views to enjoy the special location with you. 35.) What happens if we have to postpone? Any deposit/payment will be transferred to your new date, but not transferred to another couple. 36.) What happens if we have to cancel? All deposits are non-refundable. If you have settled the full payment at the time of your booking, you will be refunded the difference of the appropriate deposit. 37.) Do you handle the reception? Yes, we do handle the receptions. We contract caterers and venues, take care of the decoration, perfect table set ups, plan everything in detail and coordinate during the event to ensure that you and your guests are fine. 38.) Can we have just the Ceremony without the reception? Yes, we can suggest any restaurant if you prefer and chauffeur you to the one of your choice. 39.) Do you pick the venue for the ceremony or do we? As we are only working for your interest, you will always remain the decision maker in any case. So after receiving sufficient information about the venues, you will be the one choosing the surrounding for your dream marriage in Spain. 40.) Do you contract the venue and all the suppliers for us? Yes, we will handle all the time consuming paper work with many different suppliers for you. Working on your behalf, we select the most suitable suppliers, make sure you get exactly what you are looking for and always keep you updated about just any arrangement. 41.) Has our accommodation got to be the same place as our wedding venue? No necessarily, because My perfect wedding gives you the option to combine different wedding venues with your preferred accommodation. Maybe you want to get married by the beach but sleep in a “Cottage” in the mountain area. Any combination is possible, just let us know what you have in mind. As an agency we can offer you very good rates.